The word ‘rare’ is one that gets bandied around a lot in the world of vintage drums, especially when someone is trying to get a top price for a snare or kit. 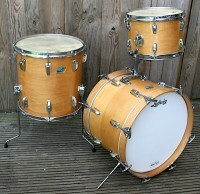 But sometimes an exceptional and really rare drum from a limited production run, or of a short lived design, turns up. 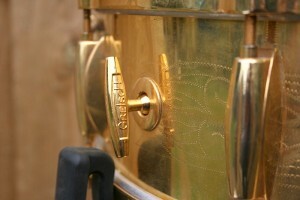 We were lucky enough to have a truly rare snare turn up on our shelves. Seen in magazine advertisments in the late 1960’s and early 70’s and billed as “The Most Beautiful Drum in the World”, Gretsch produced very few of these stunning 4160G snares. By the late 60’s Gretsch was at the apex of their already legendary drum making, and after being purchased by Baldwin in 1967, the decision was made to enter the ’boutique’ market, something which is much more common today, but back then was still rather rare. The idea was to take a standard 4160 brass shell, but rather than chrome plate it, as the standard drum was, it would be elegantly etched and hand engraved. All parts, including the shell, were then 24 carat gold plated. 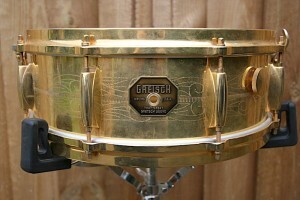 This snare really was intended to be the high point, to date, of Gretsch’s drum production. Production of the 4160G ran from 1968 to 1972 and the earliest models were sold with the legendary Round Badge. Although production stopped in 1972, the snare appeared in price lists into 1973 but was still available a year or so later. The gold plating of all components was done in house, as Gretsch already had experience of gold plating guitar parts, as well as their revered 1950’s Cadillac Green and 24 carat gold ‘Birdland’ set. 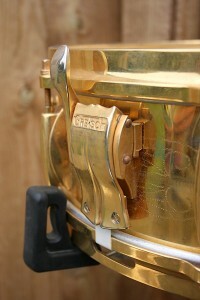 Gretsch ran two versions of this snare – the first was the earlier 8 lug Round Badge version, updated to the ‘Stop Sign’ badge around 1970. This was replaced with a 10 lug version in 1972 that was offered until 1974. With a price tag of over double the standard Chrome over Brass, the 4160G at $250 (or the equivalent of $1900/£1400 today) meant that it had a low production turnover. 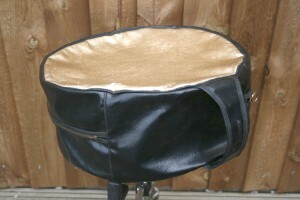 The snare was only offered in one size 14×5″. Fitted with the ‘lightning’ strainer and solid cast hoops, the spun brass shell and parts were identical to the 4160 chrome plated model at only $105. The ‘extra’ $145 ‘just’ for the gold plating may have been a bit much for many people. 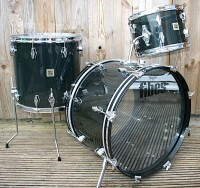 The snare we had in came from a UK collector from it’s one previous owner. Complete with gold plated ‘snap in’ Drum Key and holder and tone control, original 42 strand snare wires and factory issue ‘Elvis’ Gold Lame Case. 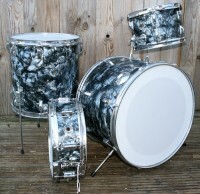 Although these drums come up for sale occasionally, most show significant signs of wear. ‘Normal’ use of the snare results in wear to the gold plating, leaving the snare with a more dull nickel look.